Tim Scott, Sales &amp; Marketing Director at JS Humidifiers, looks at how updating a humidification system can significantly reduce a building’s carbon footprint. As the most popular type of humidifier is also the most energy hungry, it has often been the case that humidifiers have been associated with high energy use. However, with modern low energy humidifiers, this isn’t so. Low energy humidifiers have a carbon footprint 150 times smaller than the traditionally popular electrode steam humidifier. However, because the electrode steam humidifier has the lowest capital cost of any humidifier, they are a favourite among budget strapped contractors tasked with installation of a humidification system. This decision can cost the end-user the initial purchase price of the humidifier every six months in energy bills. Replacing a 98kg/h electrode steam humidifier with a modern low energy model can reduce annual energy consumption from around 155,000kW/h to just 1,000kW/h for an average office application. This not only has significant implications for a building’s carbon footprint but obviously makes excellent financial sense. An electrode humidifier adds moisture to an atmosphere by boiling water and producing steam. This is rather like a continuously boiling kettle, but with a significantly higher output. As a result, they are expensive to run as they constantly require electrical energy for heating water. There are several low-energy alternatives that are equally effective humidifiers. These systems use cold water to raise the humidity level instead of steam. Cold water is either released into the air as a fine spray or simply evaporated. A spray system, such as the JetSpray, works by combining water with compressed air. These elements are mixed in precision-engineered nozzles, which atomise the water and spray it into the environment where it rapidly evaporates. It can be used to raise the humidity in a duct or spraying directly into a room. These humidifiers cost around three times as much as the electrode boiler steam generating type to purchase but the running costs are less than a tenth that of electrode boilers’. When compared to a steam generating system a JetSpray will pay for itself in a year through savings on energy alone. This does not even take into account the lower maintenance costs, which are also significantly less expensive. Evaporative humidifiers, such as the HumEvap MC3, are even more cost effective to run than spray type units as they do not require compressed air. The HumEvap MC3 is installed into a duct where the air flows through a fine matrix. Water flows down this matrix where it is picked up by the air and evaporates. These systems are less expensive than the spray humidifiers with a purchase cost of about twice as much as electrode humidifiers, but the running costs are 150 times less expensive than electrode humidifiers. An average unit would cost just £65 per year in energy costs as opposed to over £10,000 for the electrode boiler. 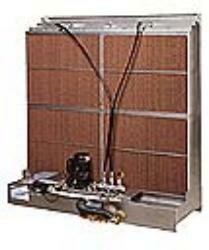 This produces a pay-back period of around eight months when replacing an electrode boiler system. The HumEvap MC3 humidifier also has the added advantage of providing evaporative cooling to an air conditioning system and easing the cooling load. This is a feature that was recently taken advantage of in an installation in Ove Arup’s head office at Fitzrovia, London, where a series of HumEvap’s reduced the temperature of the return air in the air handling system by 6oC. The humidity control available with these two types of low energy humidifiers is also very good. The JetSpray is ideal for applications that need close control of humidity to around +/-2%rH. The HumEvap MC3 has a slightly wider range to within +/-5%rH, but this is still more than adequate for humidity control in office buildings and most process environments as well. Ongoing maintenance of a humidification system is an essential part of ensuring energy costs are kept as low as possible. Without maintenance an electrode boiler humidifier can scale up within around 400 hours of operation and output will rapidly drop off, eventually resulting in the unit ceasing to function altogether. In order to maintain energy efficiency in an electrode boiler type humidifier it is essential to change the cylinders, if disposable, or clean them when required. It’s also essential that the control system be correctly set up in relation to humidifier operation at commissioning. Significant amounts of money are wasted through conflicting control strategies, including simple oversights like humidifiers operating in unoccupied office buildings. To maintain optimum operating conditions a planned maintenance schedule should be put in place when the unit is commissioned. This will take into account the hours of operation, the pattern of use, the quality of the water in question and the type of unit. In conclusion, by running a “cheap” energy-hungry steam humidifier in an average London office building can cost as much as £50,000 in the first five years. Add to that any increased consumption from lack of maintenance and the cheap humidifier is anything but. By installing a low-energy alternative this expense can be avoided, which is not only good news for building services budgets but also excellent for the environment, which will be around 130,000kg of CO2 lighter! JS Humidifiers is the UK’s largest humidification company with the widest range of products and offers a service of advice, design, supply, installation and maintenance. It also offers a comprehensive range of humidifier spares, not only for JS equipment but also for a large range of different manufacturers’ humidifiers, mostly available ex-stock.